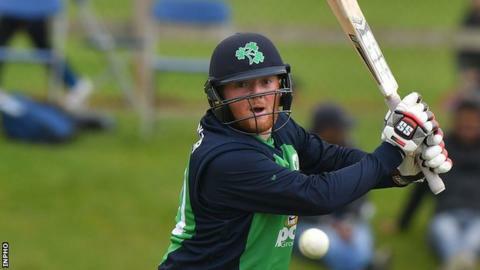 Stuart Poynter struck a final-ball six to earn Ireland a dramatic one-wicket win over the Netherlands in the T20 Quadrangular Series in Oman. The Dutch remain ahead of Ireland in the standings on run-rate, although Scotland later clinched the tournament by beating hosts Oman by seven wickets. The Netherlands could only post 182-9 from their 20 overs, despite an opening stand of 116, 78 from Tobias Visee. Andrew Balbirnie struck 83 and Kevin O'Brien 45 before Poynter's heroics. Going into the final over, Ireland needed 12 to win with three wickets in hand. However, Joshua Little and Boyd Rankin were then dismissed leaving Poynter on strike with six needed off the last two balls. Poynter failed to score off the fifth ball but then launched Paul van Meekeren's final delivery of the match over mid-wicket for six with an almighty pull shot. After racing to 79-0 after six overs, the Dutch looked set for a 200-plus total but Visee's dismissal by George Dockrell gave Ireland a lifeline. The recalled Stuart Thompson soon took the wicket of other Dutch opener Max O'Dowd and went on complete career-best figures of 4-18 as he also dismissed the dangerous Ryan ten Doeschate and Roelof van der Merwe for ducks. Paul Stirling's tight spell of 1-13 from his three overs also kept the Dutch in check with Rankin claiming two late wickets. Despite Stirling's early departure, Ireland regrouped as Balbirnie and O'Brien put on 86 for the second wicket. However, wickets fell regularly during the remainder of the innings with Balbirnie departing 17 short of his century in the 17th over to leave Ireland on 148-5. The match remained in the balance entering the final over but few could imagine the drama that was going to ensue. Ireland skipper Stirling praised Poynter's composure during the dramatic conclusion. "He turned down the single off the second last ball, which was the right decision to make with Chevy [Peter Chase] being at the other end," said Stirling. "He got one into the deck, slightly a slower ball, and he got a good bit of bat on it and hit it for six - which was brilliant to get the win." Stirling also lauded Thompson's contribution with the ball, adding: "He's missed the last two games through a hamstring niggle and just to come back and bowl like that has been excellent." Ireland now travel on to Dehradun in India for their series of matches in all formats against Afghanistan which begins with Thursday's T20 contest. Following the T20 and one-day series, Ireland will face the Afghans in a Test match which starts on 15 March.